It's hard to say no when they are asking for a book and are just sooo cute. Last Dia de Los Muertos (November 2nd) we were at a celebration and we came across a booth for this childrens book called "Rosita Y Conchita". 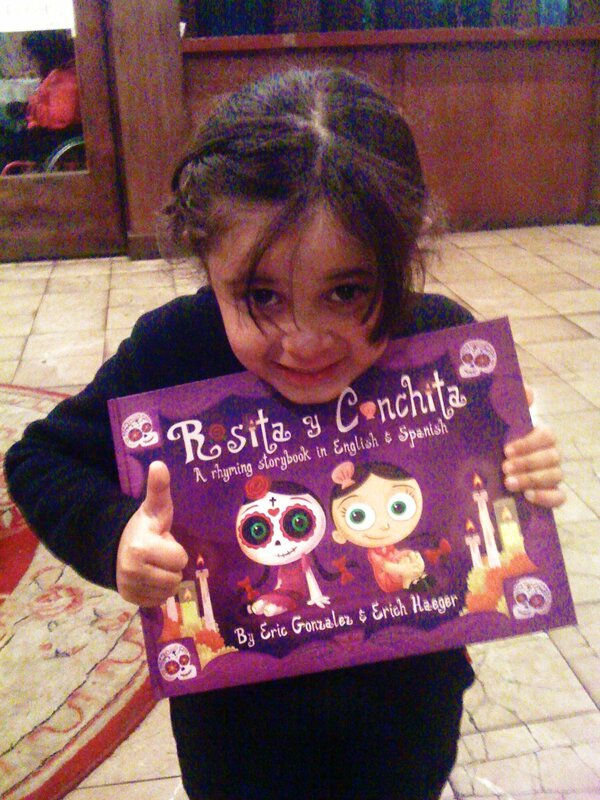 A bilingual book about twin sisters. One dead and one alive. The illustrations were adorable and The Phi fell in love with it AND they were sold out. As a consolation prize The Phi got to take home a postcard advertising the book. She has kept this postcard in her backpack ever since. Last night at Art Walk, we went into a building to use the restrooms and The Phi noticed the booth with the book was back. We went over and there was a pile of books for sale. She grabbed it and looked up at me as said "Can I get it now Mom?". I mean look at that face. What was I going to say.And it's a book. I love books. Like so much that I should marry them. So I bought her the book. And bonus! One of the authors was there and signed the book to both the girls. We read the story today after school and it was as adorable and as sentimental as you would imagine it to be. The story is about twin sisters, one living and one not, and how a Dia De Los Muertos altar brings them together. I am so happy The Phi was so excited about a book. Yes, always say yes to books!